Eleanor J Griksas, 92, formerly of the town of Port Washington died peacefully at her Harbor Club residence in Port Washington on Tuesday, August 5, 2014. She was born January 7, 1922 in Sheboygan, Wisconsin to Alois and Mary (nee Schmitt) Scherhaufer. Growing up in Sheboygan, she graduated from Holy Name of Jesus grade school in Sheboygan in 1936, and from Central High School in Sheboygan in 1940. She worked as an aide at St. Nicholas’ Hospital in Sheboygan. She married Felix Charles Griksas Jr. on October 12, 1940 at Holy Name of Jesus Catholic Church in Sheboygan, Wisconsin. They purchased his family’s dairy farm and work side by side for many years. She also worked at Philip Sales in Port Washington, the Sears Catalog store in Port Washington, and later as a cafeteria worker at Thomas Jefferson school in Port Washington retiring in 1985. Her husband, Felix, preceded her in death on October 30, 1989. Eleanor was talented in the kitchen, making delicious treats too numerous to list. She also enjoyed gardening and making strawberry preserves and jams, needlepoint and knitting. She was a devout catholic and faithful woman who was a member of St. Peter of Alcantara Catholic Church in Port Washington. She loved her family and adored her grandchildren. She is survived by her son James Griksas, grandson Kevin Griksas, granddaughter Kelly Griksas, great-granddaughter Mackenzie Griksas, sister Irene Wehrwein, sister-in-law Julie Bares, nieces and nephews, other relatives and friends. She is preceded in death by her parents, husband, brother Raymond, sisters Marcella “Marcy” (the late Ewald) Guske, Veronica “Roni” (the late Robert) Margenau, & Lorraine (the late Earl) Rydberg. Funeral Services have been held. The Reverend Patrick Wendt officiated with interment at St. Mary’s Catholic Cemetery in Port Washington. My sincere condolences to Jim and family, Aunt Irene and family, and to all my cousins and Eleanor’s loved ones. The posted picture is such a beautiful one. She looks just like I remember her from the reunion 5 years ago. She has such a kind demeanor and loving eyes! Thanks for being such a loving person – your radiant smile always made me feel loved and cherished. We will all miss you, but hope you are having fun (giggling) with your brother and sisters! Sorry to hear that mom/grandma passed. 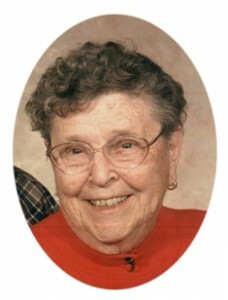 She was a very neat lady and I will always remember her smile. Thank-you for being a wonderful Aunt. I will remember you always.